It is back to school time and I have seen several questions posed on different forums asking for tips and strategies to help kids get back to school. I thought I would share some things that not only help Andrew but also help me BIG TIME! This is helpful if you tend to be rushed when it is time to get people out of the door. Try setting a timer for 5-10 minutes before you actually have to leave. This gives you and your child/children some buffer time between the time it goes off and the time you (or they) need to leave. This simple thing helps keep everyone focused while also giving some “extra” time if someone got distracted. In our house, it is not just Andrew who needs the timer. I easily get caught up in what I am doing (computer, laundry, watching squirrels play outside of my window :), etc.) 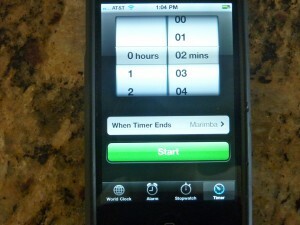 and since I know that about myself, I use a timer in the mornings to help keep me on track. I set it to go off 5 minutes before we actually need to leave so if there is something that comes up that we haven’t done, I’m not feeling rushed but it also puts gentle pressure on Andrew so he knows that it is almost time to go. This is a strategy that could be very helpful for homework time as well. I used timers with students who would lose track of time, get distracted or needed more structure around the amount of time they were expected to work on something. I’d place a timer on their desk and they could refer to it when needed to see how much time they had left to work on something. This is helpful for you as a parent in several ways. It removes the parent aspect a bit and puts more responsibility on the child. It allows you to see how your child works independently (if they are ready for that). Do they get distracted? Do they get discouraged? Are they bored? These are all things that are helpful to know and share with those working with your child (teachers, therapists, doctors, etc.). Lastly, if they are diligently working on their homework but the hours are racking up, this may be something to bring up to the teacher. I have heard some crazy hours of homework that kids are getting. Add in things like therapies or sports participation plus being in school all day and it can lead to some serious school burnout (for the kids and the parents!). 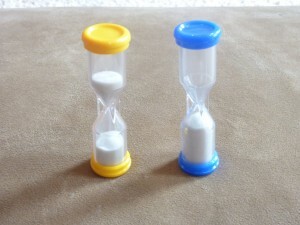 Set a timer for specific time increments so that child has an opportunity to work, take a break, work, break, etc. This helps reduce the homework time power struggles that can occur while the child experiences frustration and overwhelm with no opportunity to regroup. Combining this with breaking down assignments into the time increments also helps while teaching time management skills (perhaps I should start using this strategy with myself!!). Set a timer for a specific amount of reading time – oral or silent reading. Set a timer so they know how much time they have to work on it before a specific event – practice, dinner, tv time, bed time, etc. Turn it into a game/challenge to see if they can finish a certain part (or all depending on how much there is) by the time the timer goes off. Use the timer to give a set amount of time for them to “try their best” with something that is challenging (we do this for writing activities). Below is a previous post I did in March about timers and thought it was worth reposting as an extension of my Back To School Tips. 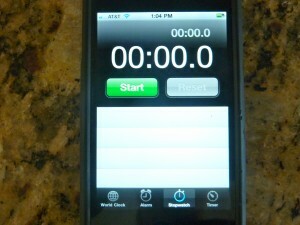 I am someone who LOVES (and needs) to use a timer. I tend to get distracted easily (wonder where Andrew gets it from!) but there is something about a timer that helps me to focus. It is great because when the timer is on, I think, “Ok, I can do ___ for x amount of time.” It seems like the same is true with Andrew. If there is something that he is not really into or is avoiding while doing My Obstacle Course, I will bring out a timer and say, “Ok, let’s see how much we can do before the timer runs out.” This really helps because he knows there is an end and that as long as he is working or trying, the timer keeps counting down time (I also make a mental note to revisit why he wasn’t into it or why he was avoiding.). I have a digital kitchen timer that I got at our grocery store that clips on my pants so I can set it and forget about it until it goes off. 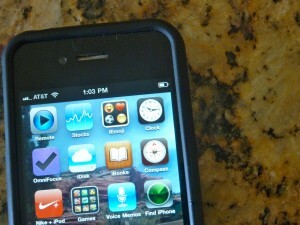 “Clock” application on my iPhone – My new favorite!! which challenges him to see how fast he can do something as well as setting a limit on an activity (works with activities that are preferred or non-preferred!). I have found that timers are also really helpful for limiting time on things like electronics or showers, both of which he could do all day long some days! It works because he knows up front that I am setting the timer and when it goes off, he needs to shut it off or he doesn’t get it the next time. The first few times he would put up a fuss but once he knew that I was going to be consistent, he got it. This is another way to remove the, “Mom says!” aspect because it is the timer that is telling him his time is up, not me. 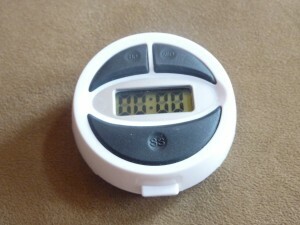 I have also just started using the stopwatch for him to earn time for his preferred activities. Whatever amount of time he spends playing with his toys or reading books is the amount of time he can earn to watch video clips of ceiling fans, play his DS or computer games. You could vary it depending on what works for you in your house but it has been working really well, particularly on weekends where he is home with a greater amount of unstructured time.